Among the various phenomena in the universe, two types produce large amounts of energy and may provide some insight into string theory: gamma ray bursts (GRBs) and cosmic rays. 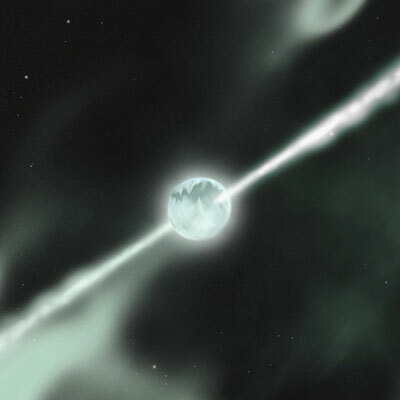 Exactly what causes a gamma ray burst is disputed, but it seems to happen when massive objects, such as a pair of neutron stars or a neutron star and a black hole (the most probable theories), collide with each other. These objects orbit around each other for billions of years, but finally collapse together, releasing energy in the most powerful events observed in the universe, depicted in this figure. The name gamma ray bursts clearly implies that most of this energy leaves the event in the form of gamma rays, but not all of it does. These objects release bursts of light across a range of different energies (or frequencies — energy and frequency of photons are related). According to Einstein, all the photons from a single burst should arrive at the same time, because light (regardless of frequency or energy) travels at the same speed. By studying GRBs, it may be possible to tell if this is true. Calculations based on Amelino-Camelia’s work has shown that photons of different energy that have traveled for billions of years could, due to (estimated and possibly over-optimistic) quantum gravity effects at the Planck scale, have differences of about 1 one-thousandth of a second (0.001s). The Fermi Gamma-ray Space Telescope (formerly the Gamma-ray Large Area Space Telescope, or GLAST) was launched in June 2008 as a joint venture between NASA, the U.S. Department of Energy, and French, German, Italian, Japanese, and Swedish government agencies. Fermi is a low-Earth orbit observatory with the precision required to detect differences this small. If Fermi (or some other means) does detect a Planck scale breakdown of relativity, then that will only increase the need for a successful theory of quantum gravity, because it will be the first experimental evidence that the theory does break down at these scales. String theorists would then be able to incorporate this knowledge into their theories and models, perhaps narrowing the string theory landscape to regions that are more feasible to work with.